Made this with added chunks of fresh pumpkin. Did not add the chilis but the soup still had a good flavor and "bite" to it. Very simple but very good, with added bonus of being healthy. Will definitely make again. Very easy and tasted great! Used gorgonzola instead of stilton, did not add cheddar. If not using all of this soup the first night, just add cream to amount being served. Then leftover soup can be frozen and used as a base for another soup or vegetable stew in slowcooker (zucchini, eggplant, onion, chickpea). This soup was surprisingly nice; all the ingredients came together to create a gently sweet taste tempered by the mild saltiness of the miso. Used leeks instead of onion since it's what I had and it worked well. Will definitely make again! Easy and delicious. I garnished with almonds. Would also be good with mushrooms in the soup or with a mushroom stock. Popular with the family and easy. I made the following modifications: diluted chicken broth in place of water; will try with water alone next time. added a large onion and pureed along with the chickpeas, and will do it again next time. Added flavor and reduced graininess. Might add a half cup or so of rice next time, too. Lots of garnishes possible--I used toasted chickpeas, minced cukes, chopped black olives, chopped fresh thyme, sumac, and a drizzle of olive oil. 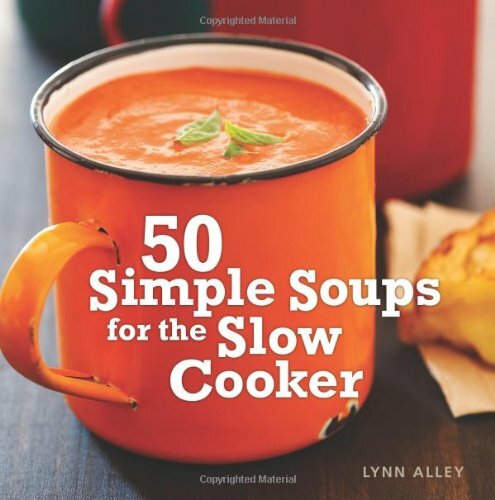 Lynn Alley, author of The Gourmet Slow Cooker, is famous for creating flavorful homemade meals using the kitchen's most coveted countertop appliance--the slow cooker. Inside 50 Simple Soups for the Slow Cooker, Alley presents bold combinations for 50 new vegetarian and vegan soup dishes that are as hearty as they are flavorful. A few classics such as Ribollita and French Onion mingle with many unique offerings, including Swedish Rhubarb Raspberry Soup, Garnet Yam Soup with Coconut Cream, and Eggplant Soup with Cumin, Yogurt, and Dill. 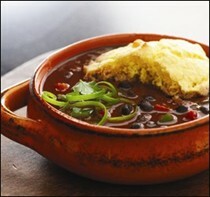 There are 15 mouthwatering photographs of steamy, slow cooked, spoon-to-mouth goodness. A concealed wire-o format ensures ease of use with lay-flat binding and effortless page turns, while the book's 6 1/2 by 6 1/2-inch trim size makes it a handy resource in the kitchen as well as a perfect gift for on-the-go families.